Released May 18, 2017 Yokohama’s newest mud terrain, the Geolander M/T G003™, definitely caught my eye. Being personally plagued with less than desirable mud terrains, and the many problems associated with them, I felt the market was ready for a new offering. The last three sets of tires I went through left me wondering if I could find a tire that fit my needs. I’m pretty sure the current set I run has at least thirty plugs in the tires on the ground and desperately need to be retired. The spare has fifteen plugs alone and a bulge in the sidewall rendering it completely useless at this point. The joke in camp is that I may be the only person to have a tire failure from a bunny rabbit. Somehow my tire met its match when it encountered a fluffy cottontail. I assure you that it was not intentional and I felt really bad if that helps anyone sleep at night. Initially my thoughts were of the SEMA show trucks and this tire would be right at home in that arena. Yokohama certainly knew there is a huge demand and will hold a significant market share. The design complements the trucks and has an aggressive look that satisfies any form vs. function argument. The exciting part is that in that same judgement can hold its own as a sold mud terrain. Show and shine to the most challenging of terrain, I honestly believe they nailed it. It would also be fitting to mention Yokohama’s previous Geolander has stood the test of time and has a large following to this day. That is something I wouldn’t think would happen if they didn’t perform well to be honest. Moving on to the specifications, Yokohama presented each one with passion. Their engineers and marketing leads addressed all concerns. Of the tires available, many manufactures did not offer a 17” E rated 35. Admittedly biased, that was the first specification I looked for and Yokohama delivered! The Geolander M/T G003 is available in 37 sizes ranging from 15” to 20” rim diameters. The next thought that came to mind was the durability. Specifically, I wanted to know if the tire could be aired down without compromising the integrity of the sidewall. We would test that later in the day and, I can happily report, outperformed my expectations. Per Yokohama, the Load range D and E tires are constructed with three polyester body plies (two on load range C tires) with two high-strength steel belts supporting the tread. A full-width nylon cap is added for additional durability. As a bonus, Yokohama incorporated the sidewall armor into the design to increase traction and protection. Traction in mud and snow should be exceptional with the large voids and incorporated mud and stone ejectors. Although I haven’t had a chance to drive this tire in winter conditions, Yokohama did report their optimized block-to-void ratio and sipes stops 51’ shorter on wet roads. 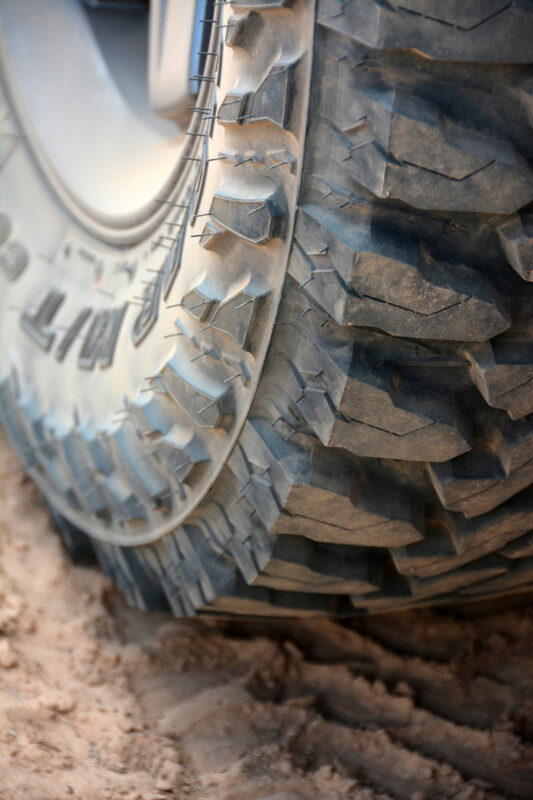 As much as we all want a mud terrain to perform flawlessly on ice, it is a limitation of any mud terrain and a compromise to running multiple sets of tires depending on the season. I accept that and still believe this tire would do well in the winter when compared to other mud terrains on the market. It is worth noting the tread design has lateral tread blocks to increase traction when on a side hill. That is a feature that is extremely important when you find yourself on a slick surface with the vehicle leaning toward the downhill side. The engineer I spoke with mentioned a lot of effort was put into reducing the noise of the M/T with a 2.3db reduction on the highway. The last specification covered was the 8% longer tread life gained by their triple polymer blend and wide flat profile design. With the technical specifications covered, we were given the chance to experience, first hand, what the tire was capable of. My first impression was very positive and I did my best to remain neutral. It would be natural to compare the tire to past experiences and every situation I could think of showed this tire as a strong contender. The folks from the Vegas Off Road Experience (VORE) brought their short course trucks down and equipped them with the new Geolander M/T G003™. We raced them around the track and we did our best to push the tires to their limits. From my perspective, I couldn’t find any issues. Breaking was spot on, high speed cornering was exceptional, and the tires showed very little wear with no signs of chunking after we were though. They also performed very well when forgetting a turn and launching sideways under full throttle (although I won’t admit that publicly). Now, switching from the VORE trucks to a trail ride in Geolander equipped Jeeps might seem a little tame; however, it was an excellent test and, again, the tires met and exceeded my expectations. The trail was selected to contain most terrain you would expect to encounter including short sections of rock and the vehicles were four door JKs running 35×12.5×17 LTs. We left Gateway, Colorado toward the Utah border exploring an area rich with old uranium mines. On pavement, the road noise was minimal. Switching to dirt felt stable and the tires handled the washboard roads well. I tried to take a few turns under throttle, to see if I could get the back end to kick out, and everything stayed in line. The next test was an airfield on the top of the mesa with extremely silty soil. The tires rolled through soaking up the bumps and stayed true without any negative results. The tires held on the rocks conforming to them as we crawled each truck through. Overall, I was impressed. No bunnies were harmed that day but, I can say with confidence, these tires would excel in that category too. Thank you Yokohama for giving me the opportunity to test this tire and thank you for being an exceptional host. I look forward to continuing the test of the Geolander M/T G003™ and would gladly trade out my current tires for a set of these. I made a conscious effort to remain neutral, as we put these tires through their paces, and was pleasantly surprised. I have logged many thousands of miles on expeditions across the U.S. and your tire would be right at home on my adventures. Your design is what I look for in an off-highway tire. Thank you.